4/1 UPDATE: We did it! With a surge of donations at the end, we blew past our goal and raised $2,323.99 this month. 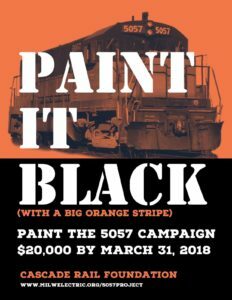 With the matching donations, that means we are $4,323.99 closer to having the funds to repaint the 5057. We now have about half the total we’ll need. Thank you to all of our Friends of the 5057! 3/26 UPDATE: We have raised $650 so far this month. Another $350 is needed by Saturday, March 31 to get the full match of the challenge. No, we aren’t really bad at math. We have a fundraising challenge from an anonymous donor. The donor will match up to $1,000 dollars between now and March 31, and their employer will match their donation. For a limited time, each $1 you donate will turn into $3 for the 5057 Project. Donate now to help us ‘paint it black’. And orange too!